Well here it is – the top of my Denyse Schmidt Greenfield Hill quilt. I must say I’m quite excited about this one! I had a great time making up the individual improv blocks, and working with fabrics that are not quite my typical colors. Seeing them now though, I’m thinking that perhaps they should be included as new favorites. It’s a welcome change to all the brighter colors I’m typically drawn to. I had this design in mind from the very start. I knew that I wanted the blocks to be set on point, and I also knew that I’d probably get tired of making blocks long before I had enough for a good sized lap quilt. I started thinking about one of my older quilts – A Sprinkling of Hexagons and how the hexagon look was achieved, without having to make up an entire quilt of hexagons (does this make me sound lazy?!) Anyway, the minimalist look of the smaller pieced section paired with a solid appeals to me and I thought I could achieve a similar look with blocks this time. Since I had included Kona Snow in several of the blocks to brighten up the overall look, I decided to go with the snow for the rest of the quilt as well. I also decided to do a very thin sashing in snow between the blocks as well. I’m really happy with how it turned out, and can’t wait to get it finished! And this photo is for those of you who feel badly for Morgan, what with all the quilts I make him hold up (in all kinds of weather!). I even feel slightly bad for him here – it was snowing pretty hard, and I dragged him into the middle of the road, stole his gloves, and made him try and hold up a largish quilt (without letting it touch the ground, of course!) Luckily, he’s a great guy and a really great sport! 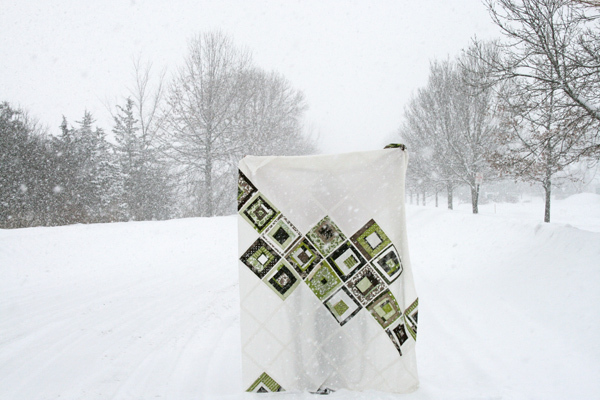 This entry was posted in [search] Square-in-Square Quilts, [search] Wonky/Improv Quilts, Posts about Quilts, Quilts and tagged denyse schmidt, greenfield hill, handmade, improv blocks, kona snow, quilt, quilting, set on point. Bookmark the permalink. Very nice quilt! I love the darker colors too…something that I probably don’t use enough of. 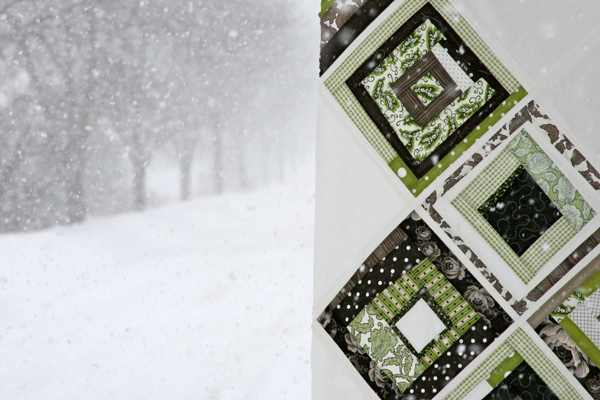 I think the snowy backdrop is perfect for this quilt. Any bright fall, pastel spring, or green summer would have competed with the quilt. So I think you did a perfect job all the way around. Not that I made too many quilts but, I always get in the mental rut that I have to make 100 blocks to make a quilt. And that is overwhelming to me. You always remind me with your designs that I can through a huge hunk of solid in there. Thanks! I LOVE the layout & the colors are just fab! Great quilt! I think this quilt looks great! 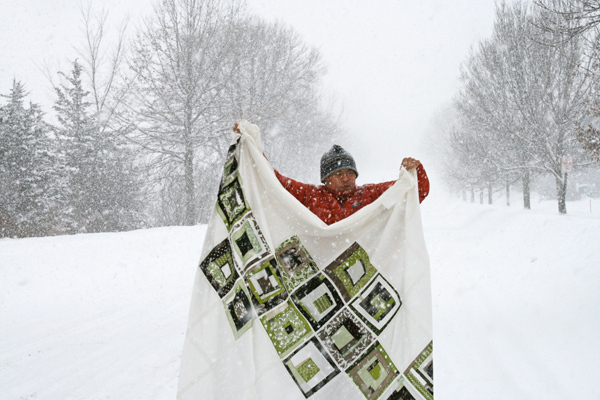 And, I think the snowy weather is the perfect way to photograph the quilt. I really love this quilt it reminds me of winter my favorite time of year I’d be useing it all the time. Wait, didn’t I just see a completed quilt top a couple of days ago? Where do you find the time? Love the colors and the creative layout. This is unbelievably beautiful, and the setting makes it perfect! You did an awesome job!!! It’s gorgeous! And what a great guy you’ve got there! your man is quite cooperative! what a pretty pretty quilt! greenfield hill is growing on me. i wasn’t sure at first. nice work! It is delightful. I love how you have placed the blocks diagonally. Nice touch. I agree with you on the fabrics too. 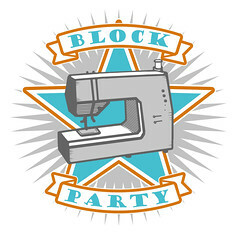 Seeing those blocks together have just “forced” me to order some of the fabrics. Great change of pace! You know, I haven’t been sold on the Greenfield Hill line, either. But I also said the same thing about Hope Valley initially, and grew to adore it. I think I may find myself eating a bit of crow before too long, and your quilt is helping to convince me of that! What a fantastic setting! Man, it’s really snowing hard!!! I love the snowy photos… and the way the design feels sort of loose / unplanned. Lovely. love this quilt~very nice. i love the white and how it’s set on point. super cool shots with the snow! I join the chorus about Greenfield Hill! 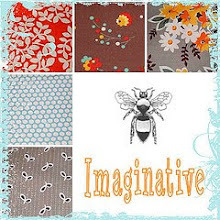 You make an otherwise dull fabric line into a fantastic-looking quilt. Better not freeze Morgan this winter so the little guy won’t have a Daddy with frostbitten hands…lol. you make it sound SO easy ashley!! Gorgeous quilt! Love the design which is totally unique to my eye. Am so impressed with your improvisations! This is just lovely!!!! Really makes me want to go and get the fabric too!!! Oh it is gorgeous! Love the asymmetrical layout…very pretty! Looks like you’ve got a very good helper there…that is quite some storm to be taking pictures in! He IS a good sport! The quilt is really wonderful. It’s beautiful! I love the casual, scattered around look, and all that Kona snow really brightens up the whole thing. Another great design! Love this quilt!!!!! But, you stole his gloves too? hahahhahaha, totally made me laugh! You know, I didn’t think too much of this new line either, but your quilt is gorgeous. It might just change my mind. Three cheers for Morgan! And, yes, I like this creative quilt. Ashley, that quilt is spectacular! I love the “minimalism” of it – such a great idea, and it translates to grand scale! Thanks for all the inspiration, once again! Oh, I love this quilt. The photos are wonderful – I’m so pleased you did make him stand in the middle of the road as they’re such perfect pictures…& it doesn’t look like he was in too much danger of being run over. I am awarding to Morgan 10 points (I don’t give them out often so ten is good) in the good husband contest in the over and above category. Well done Morgan!! Also, I love the setting of your quilt. It is gorgeous. Very lovely. I am always impressed with your creativity. Nicely done. Interesting that you still did all the background as blocks as opposed to strips. GO INSIDE! It looks bitter cold and no one should be out in that craziness! that being said, the snow coming down around that quilt and fabric makes it even more lovely. You are turning me into a fan of this collection! What a guy, and luuuv the quilt. Also like the snowy backdrop! OHH I really like that! Oh, it is as beautiful as I thought it would be….simply YUMMY. You do such great work…such a talent. Oh, but the photos were worth it! A fantastic backdrop for the quilt. You’re a good man, Morgan! And no, you don’t sound lazy. The quilt actually looks really awesome the way that you did it. It’s fresh. Fabulous. I also have a well trained quilt holder! I absolutely love that quilt! In fact, this may be one of my favorites of yours! Beautiful. I am truly inspired by the stark, simple, beauty. He is definately a keeper! Great quilt, as always! It is a lovely quilt, but what a great guy. Brrrrrr. Lovely quilt. So cold. I think you out did yourself on this one. It is amazing and oh so modern. Using just enough color, more for me would have been too much, and the design! Love it!!!! Love this quilt! The colors give it a calming feel and the layout is great. Tell Morgan we all appreciate him helping us look at all your beautiful work. Thanks! I love the green/gray combination! I must get out there and get caught up with the rest of the quilting world and buy some new fabrics. Nice quilt holder too! it is so gorgeous!! I love the way you angled the blocks, you are a creative genius! Ummm….Morgan doesn’t look like he is having lots of fun out in the snow though, heehee. Your quilt colours really go with the snow! i’m not normally a fan of greens but i love this quilt top!!! I love this quilt! I was not a huge fan of this new line of fabric, but you have made me love it! Beautiful, modern quilt! this is a lovely quilt, ashley! i love the photos. such a perfect setting for the quilt. So seriously, last night while I could not sleep, I thought about this quilt. It is stunning. I wish I had enough confidence in my quilting to come up with something so creative and beautiful. Thanks for continuing to inspire me. can’t wait to see the finished product. so jealous of the snow. hardly a flake in oregon this year. I am loving this quilt! I have to admit that these are my colors either, but that being said….WOW! I’m going to have to make one of these. Thanks for sharing! Lovely quilt. Modern design. Any plans for filling those blank spaces with quilting? There is a lot of potential there. I think this every time you show a new quilt, but I am in love with this! Great job! Sounds like you got lucky with that hubby of yours – what a trooper! Go Morgan! Your quilt is great … i luv the blocks! 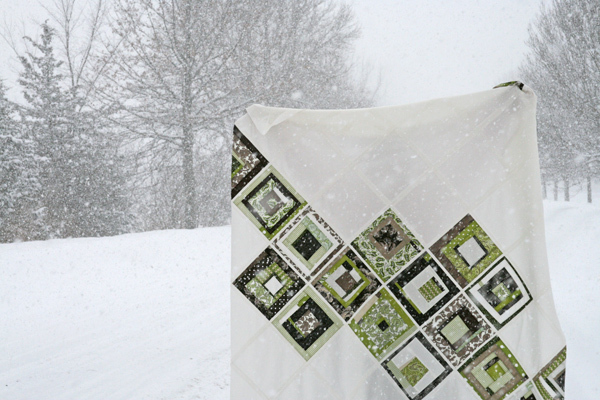 But tell me, i must be crazy cuz i keep seeing pictures of quilt tops out in the snow and drapped across snowy fences and i just cringe…i hate the thought of my tops getting wet or being out in the bad elements … i may have to bit the bullet and try it … they make great pics! Pingback: The Crafty Trap « i SAW it!